Do you have crowded, gapped or otherwise occlusal diseased teeth? If so, they’re damaging more than your confidence — those problems could also be putting you at a greater risk for periodontal, or gum, disease. Maybe you skipped the braces stage in adolescence, or perhaps the misalignment happened gradually over the last decade or so. Whatever the cause, you’ve got to seek a healthy solution. More adults than ever are getting braces these days, but that doesn’t mean metal brackets and wires, — Invisalign provides our Ripon neighbors with straighter better aligned teeth, invisibly. Read on to learn more, and find out if Invisalign is right for you. Invisalign is an FDA-approved straightening treatment that uses a series of clear, custom-fit trays to reposition your teeth into the desired alignment. The trays are made to fit your unique mouth easily by using state of the art, digital imagery from our iTero scanner to get a highly accurate image of your teeth. Once you receive your one-of-a-kind Invisalign aligners, you’ll switch trays every two weeks to advance to the next stage in treatment. You will have regular appointments to ensure your treatment is progressing well, and to pick up trays as you go. Removability: Don’t worry about any special cleaning or eating techniques. 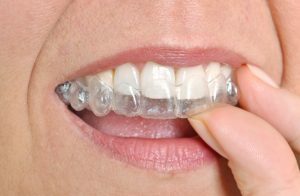 The clear Invisalign trays can be easily and discreetly removed before eating and before you brush and floss your teeth. Speed: Because the clear trays are excellent at quickly repositioning your teeth, the Invisalign system works much faster than traditional braces. Comfort: With the clear, thermoplastic Invisalign liners, you’ll never have to worry about a bracket popping off or a loose wire rubbing a sore on your cheek — typical metal braces woes. This system truly provides the most in comfort. Is Invisalign a Good Choice for You? In order to be a good candidate for the Invisalign system, you need two things: good overall oral health and a strong desire for a healthier, straighter, and beautiful smile. Does that sound like you? If so, you’re probably an excellent candidate for this solution to misaligned teeth. Healthy, beautiful teeth are an investment that will allow you to keep your own teeth for a lifetime. Right now,Silver Creek Dentistry is extending a special offer on full treatment cases! What could be more important than preserving your health, and keeping your teeth where they belong, in your mouth! If your smile is misaligned, you’ve got to fix it — and there’s never been a better time to do so than now! Don’t wait — schedule your appointment with us today. We are here to help make this work for you!